Positive Behavioral Interventions and Supports (PBIS) is an application of a behaviorally-based systems approach to enhance the capacity of schools, families, and communities to design effective environments for learning. PBIS aims to improve the fit or link between research-validated practices and the environments in which teaching and learning occurs. 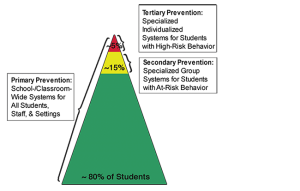 Attention is focused on creating and sustaining Tier 1 or primary (school-wide), Tier 2 or secondary (targeted), and Tier 3 tertiary (individual) systems of support that improve lifestyle results (personal, health, social, family, work, recreation) for all children and youth by making problem behavior less effective, efficient, and relevant and desired behavior more functional. Adapted from pbis.org U.S. Office of Special Education Programs national and technical assistance center on Positive Behavioral Interventions and Supports (PBIS). All students will benefit from the establishment of a culture of competence within a school building to provide multi-tiered behavioral supports. Statistics indicate that 80% of students will thrive in a school environment that is positive, predictable and supportive (primary prevention) and have one or fewer office discipline referrals per year. We cannot assume, however, that universal Tier 1 supports will be sufficient for 100% of students. 15% of students will be at risk for chronic behavior problems, and will require a Tier 2 supplemental intervention (secondary prevention) or support. These students have 2 to 5 office discipline referrals per year. 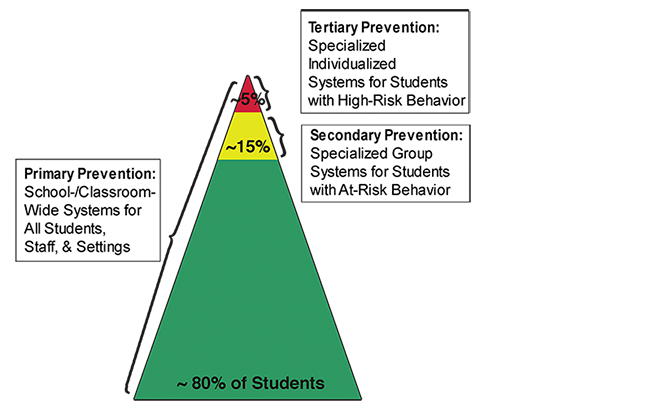 About 5% of students will have 6 or more office discipline referrals per year and will have needs that require Tier 3 individualized or intensive support (tertiary prevention) in order to remain in school and be successful learners. Schools interested in pursuing PBIS training are encouraged to contact Dr. Carol Sensor or Jackie Fober to find out more information. A summary of the process to initiate and participate in PBIS training is described below. Arrange a 45-60 minute PBIS overview to all school staff at your school. After staff PBIS overview, staff vote to determine if 80% or more staff are committed to participate in PBIS training and/or implementation activities. Behavior and/or culture and climate must be one of top 3-5 school improvement goals. Administrators must be actively involved in the PBIS training, planning and implementation process. Collect baseline discipline referral data and other culture/climate data to determine if PBIS training is a good “professional learning fit” for your school. School Administrator completes and submits AEA 267 Learning Supports Application to pursue PBIS training. Participates in all PBIS trainings for three years: 4 days in Year 1, 4 days in Year 2 and 3 days in Year 3. Participates in monthly PBIS Team planning meetings. Trains school staff on PBIS strategies and facilitates staff input. PBIS coach attends three Coaches Meetings at AEA 267 per year to receive additional support, technical assistance and networking opportunities. Over the last decade, the Iowa Department of Education has demonstrated a commitment to building the capacity of schools, families, and communities to support the social, emotional, behavioral, and intellectual development of children. That commitment was evident in the Iowa Behavioral Initiative (1993-1998), Success4 Initiative (1998-2004), and in the redesign of Success4 into a system of Learning Supports (2004-present). School-Wide Positive Behavioral Interventions and Supports (SW-PBIS) is an initiative of the U.S. Office of Special Education Support’s (OSEP) National Rehabilitation Research and Training Center (RRTC) at the University of Oregon. In 2002, through the Success4 Initiative, fourteen schools in Iowa were selected to receive training in SW-PBIS. Since that time, PBIS has significantly in Iowa. There are currently over 600 schools implementing PBIS in Iowa. Every AEA has a team of PBIS trainers to provide training to schools to implement PBIS.